The interior of Locust Grove has been furnished to show the home of family of wide connections and sophisticated taste. The tour below lets you "walk" through the house. 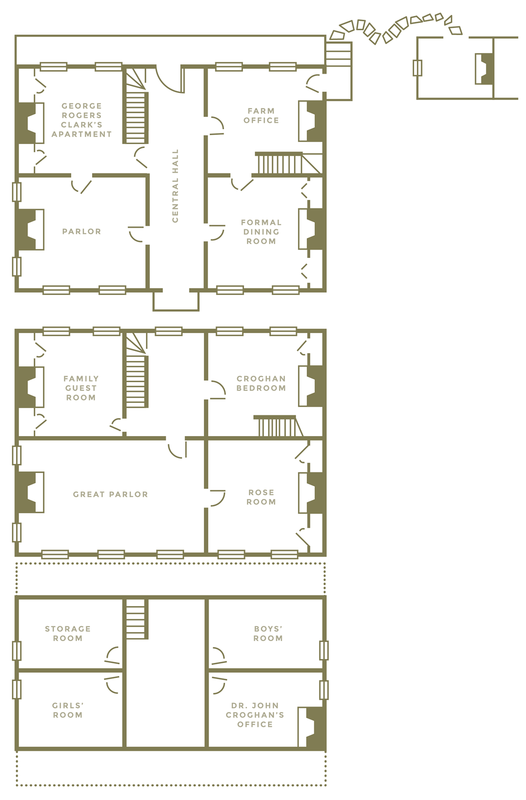 Then scroll down further and click on each room on the floorplan to learn more about the house when the Croghans lived here. Click below to explore the different rooms of the house. In the Kentucky of the early years of the 19th century, the time period represented here, the country “seat” of a gentleman could be as fashionably furnished as anywhere else in America. Few original family pieces remain, since the house’s contents were sold at auction in 1849. Portraits, swords, books, and silver are all that survive from the Croghan family. Since restoration began in the 1960s, collection pieces have been acquired based on wills, inventories and other documents of the Croghan family and their Clark relatives in an attempt to illustrate life in a wealthy family of the time and place. 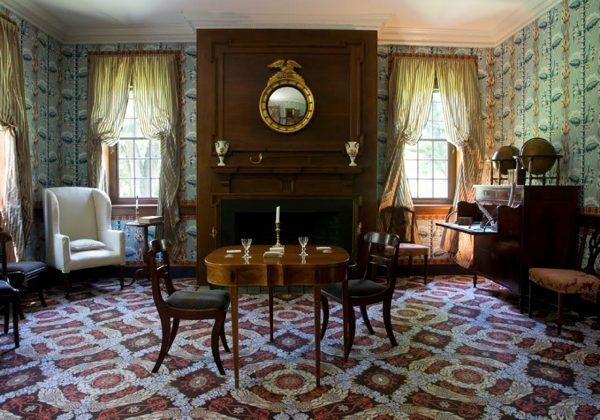 Although the Croghans had access to things from all over the world through Major Croghan’s import connections, Kentucky craftsmen produced most of the large furnishings found in fine Kentucky homes such as Locust Grove. The furniture collection at Historic Locust Grove is considered to be one of the finest collections of Kentucky furniture anywhere. Also on display in the house are six family portraits, three of which were painted at Locust Grove, including George Rogers Clark, the senior Croghans, Ann Croghan, and George and Serena Croghan. This was a place for farm and business: goods delivered, contracts signed, tenant rents paid. Though a work space, it still was mean to impress, tied visually with the hallway by the verdigris paint, and linked to the room above by a private stair. While working here, Croghan could also invite important contacts into the adjoining dining room for further entertaining and negotiating. Locust Grove was a working estate, with crops, goods, services, and land traded, bought and sold. Lucy Croghan would have used this room in her role as Croghan’s deputy in the farm’s business. Croghan’s surveying business could be carried on in this room, at least until he built a separate office in the garden. The secretary desk features a graduated serpentine front and is one of many fine Kentucky-made pieces in the house. The door on the left rear is an original house door. This formal room was probably used for the main daily meal, entertaining, and for the men to gather in the evenings after dinner. The position of the Croghans in the county and state and in the political life of the nation (through two generations) is shown through the portraits, the silver, and the table settings and fine furniture. The enslaved servants would have been quietly present in the room, setting, serving, cleaning, and supporting the life of the House. The punkah, a fan above the table, is a kind of fly-swatter that originated in India and was popularized in port cities like New Orleans. At Locust Grove, a letter tells the story of the enslaved boy who fell asleep while pulling on the punkah’s cord, and continued in his job while sleeping. The portraits of William and Lucy Croghan were painted in 1820 by John Wesley Jarvis. The portrait of Ann Croghan Jesup by Charles Bird King was recently re-discovered in a barn in England, and is now restored to the collection. The five piece Federal silver coffee and tea service, each piece bearing an incised arm holding an arrow, possibly a part the Croghan family crest, was made for the Croghans by Jean Baptiste Dumoutet of Philadelphia in 1810. The sugar chest, used to store this valuable condiment, is a fine specimen of the period. The original walnut paneling is intact; it is unusual to find it unpainted in this period. This was Clark’s room, a kind of apartment within the house, where he continued to live and socialize, learn and study, during his residence with the Croghans. He was a respected and revered elder who continued to struggle for recognition and compensation from the Federal government, but he was also a man of action frustrated by the inactivity forced upon him by ill health and his amputated leg. 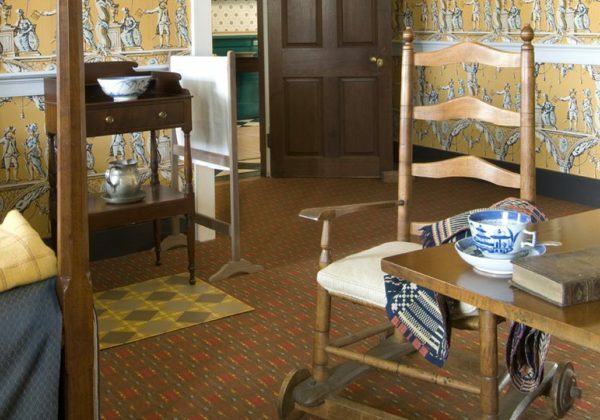 Clark was cared for by Kitt, an enslaved man who probably slept in the room to attend to Clark when he was ill, and who pushed Clark in his wheeled chair around the house. Kitt was freed by Clark’s will in 1819. 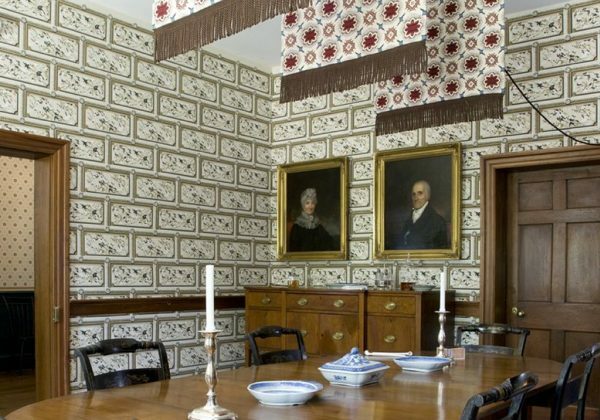 This room might have been used as a family dining room prior to Clark’s arrival, and the walls are papered with a cheerful and patriotic allegorical pattern with a “1776” motif. The original fireback also has a patriotic theme, featuring an eagle. 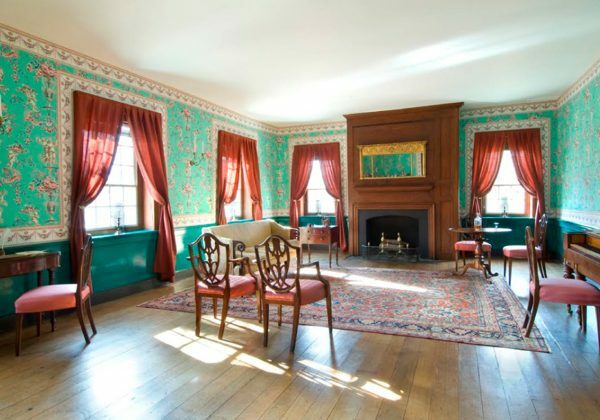 The parlor was a space for the women in the household, who used this room for work and entertaining during the day; in the evening, it became a place for small groups to gather Evidence of women’s more genteel occupations and accomplishments are here (sewing, letter writing, whist). The room was used when smaller gatherings of people were in the home. The tea service shows the important role of the ritual of making and serving tea as a sign of status and hospitality in the early 19th century. John Wesley Jarvis painted the portraits of Col. George Croghan and his wife Serena Livingston Croghan. The silver tea pot and the secretary/desk in the room originally belonged to Jonathan Clark, eldest brother of the Clark family. 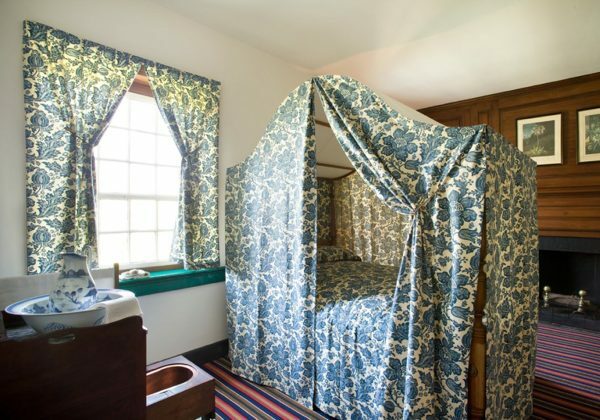 With its imported Brussels carpet and fashionable draperies, this is a stylish room decorated to represent the year 1815. 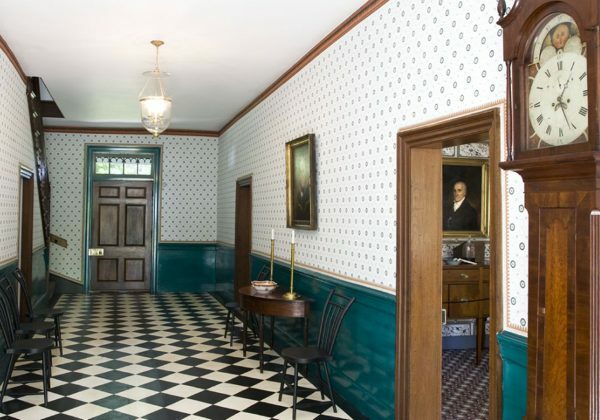 The hallway was painted with the signature verdigis glaze that is so prominent at Locust Grove. The room was wallpapered and could be used as an actual living space, not just a passageway. In warm weather, open doors allowed for a pleasant sitting area. A trestle table could be unfolded for added dining space. Guests would be greeted here, and led into the formal rooms of the house. Shortly before his death, General Clark sat for a portrait by young Kentucky artist, Joseph H. Bush - the only known portrait of General Clark done during his lifetime. The effects of the strokes he had suffered are evident on his face. He wears newly purchased and tailored clothing for the sitting. The original carved woodwork on the staircase is similar to other houses of the period in the area, suggesting that a team of skilled artisans and woodworkers, probably included enslaved workers, crafted the architectural woodwork and traveled to work on houses under construction in the region. 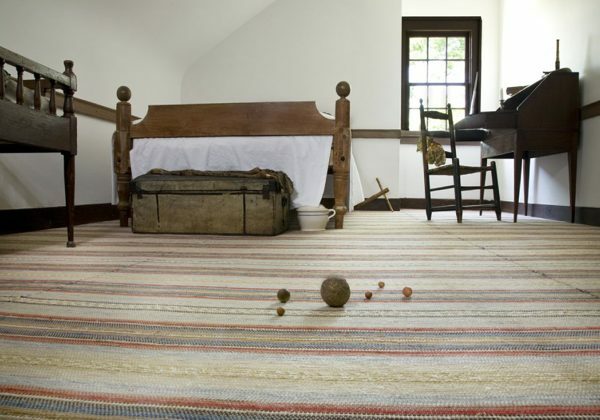 The diamond floorcloth is a typical pattern in oilcloth canvas rugs that protected floors in hallways of the early 19th century. 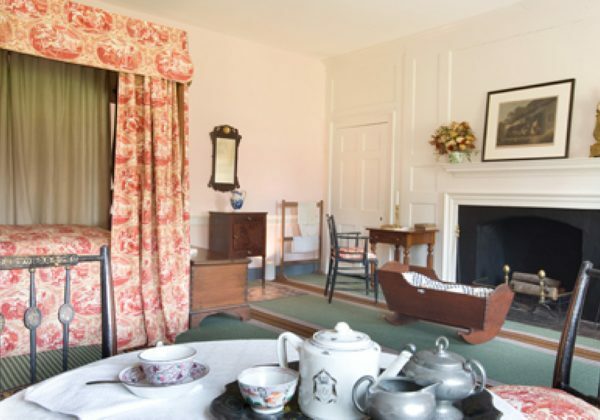 This space introduces a visitor (then and now) to the world of William Croghan and his family; a space meant to impress the visitor with his sophisticated and appropriate taste, linked to the elite world of upper South planters and Revolutionary and political leaders. Here, the conservative Georgian architecture with its foursquare symmetry is literally lightened by the fanlights over the doors, a suggestion of the emerging Federal style. 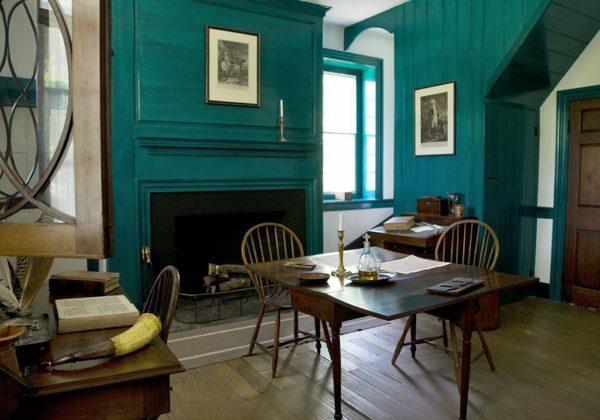 This room is visually and thematically tied to the room below it, the farm office, through the verdigris paint scheme and through the staircase which was added to the House as an early afterthought. 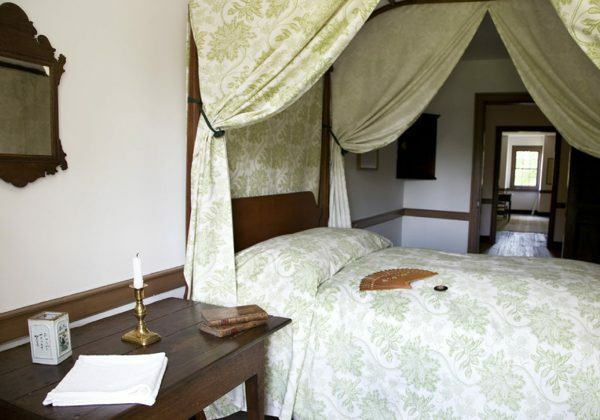 This room is interpreted as William and Lucy’s bedroom, a private space, though elevated in status by the color scheme. Their marriage lasted through nine births (eight living children), and many years of working together to manage Locust Grove. William traveled a great deal as a surveyor, and Lucy ran not only the domestic side of the household, but often the entire work of the farm. The furnishings include an early commode, to spare the ladies the undignified journey to the outhouse, more convenient than a chamberpot. The house welcomed many guests for short and long stays, including members of the extended Clark family. At another time, this room might have housed Emily and Nicholas Clarke (cousins of William Croghan, not Lucy) who lived here while tutoring the Croghan girls. The cheerful ochre yellow paint brings light to a dark corner of the house. This room, reached by the Great Parlor, was probably the best guest room, though when important guests were not in residence, it would have served the rest of the family. 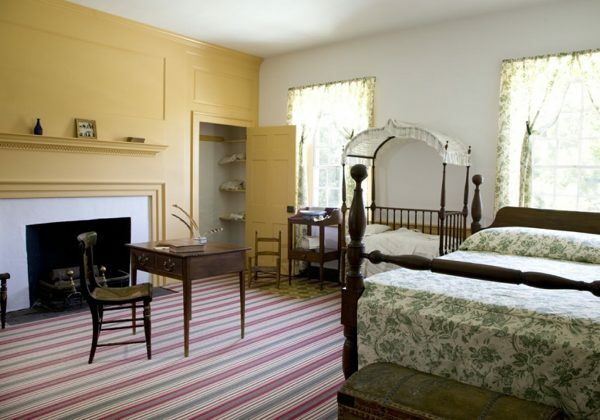 Among the guests who may have slept here were John James and Lucy Audubon, President Andrew and Rachel Jackson, Aaron Burr, and James Monroe. It is furnished in the French style so popular in early America. The “Great Parlor” was the main sitting and activity room of the house, with the finest paint and paper. The Croghan household was large and fluid, complete with parents, children, live-in and visiting relatives as guests, tutors, visiting neighbors, visiting dignitaries, and, in the background, the slaves who waited on and served all. The largest room in the house was a place to gather for the family. At other times, it might have been used as a ballroom, schoolroom, meeting room, dormitory, and many other uses. This room would hold the light longest with its southwestern exposure and windows on two walls; day would end in this room. The fortepiano in the room was made by Broadwood in London in 1806 and is still used for concerts. The wallpaper was reproduced from fragments found in the room during the 1960s restoration, using original techniques and materials. The pattern is a pre-Revolutionary French arabesque pattern, very costly, that was probably copied later in America and purchased by the Croghans. In this room, out of our usual time frame, it’s the 1840s. This represents the history of the house after William Croghan’s death in 1822, when the next generations moved in and out of the shared house. This room focuses on John Croghan (the eldest son), and his work as a doctor and as the owner of Mammoth Cave. Here he studied diseases and cures of the day in an attempt to cure his own family of tuberculosis. As owner of Mammoth Cave, Dr. Croghan owned and supervised the enslaved cave guides, including Stephen Bishop, who drafted a famous early map of the cave while at Locust Grove. John emancipated the Locust Grove and Mammoth Cave guides in his will in 1849. He was also a friend and supporter of John James Audubon, and the room reflects his interest in botany and birds. The third floor rooms retain their original woodwork and paint – never repainted or restored. This room is furnished as the boys’ bedroom. The three elder Croghan boys were close in years, and doubtless shared a room. The heat and cold of the attic might have prevented them from sleeping here year-round. The three younger boys probably also shared a sleeping space. The two Croghan girls, Ann and Eliza, probably shared a room. They lived at home except for a brief period at a girls’ academy, and left Locust Grove when they married, although both returned for long visits and the births of their own children. A large house required an area for storage of bedding and extra clothing, and so this attic room holds unused textiles and outmoded or broken furniture and equipment.